Zhang Fei Torbjörn is the newest skin for Overwatch's Lunar New Year event – AiPT! Ho ho ho, alright! A new Torbjorn skin! Monday evening Blizzard unveiled the newest Overwatch skin for the game’s upcoming Lunar New Year event — Zhang Fei Torbjörn. This is the fourth skin revealed for Overwatch’s yearly celebration of the Chinese New Year, with Guan Yu Reinhardt, Huang Zhong Hanzo, and Lü Bü Reaper already being revealed for this year’s celebration being for the Year of the Pig. As expected, Zhang Fei Torbjörn is inspired by a general from China’s Eastern Han dynasty and was a major character in the 14th-century historical novel Romance of the Three Kingdoms. The novel dramatizes events before and during Imperial China’s Three Kingdoms period, and every skin revealed for the Lunar New Year event thus far, has been inspired by characters from the novel. The new Zhang Fei skin has Torbjörn sporting a red headband, a dragon head has replaced his claw, two swords across his back and a mace in place of his patented hammer. His trademark turret wasn’t left in the cold, it received a makeover that nicely matches up with his new armor design and colors. 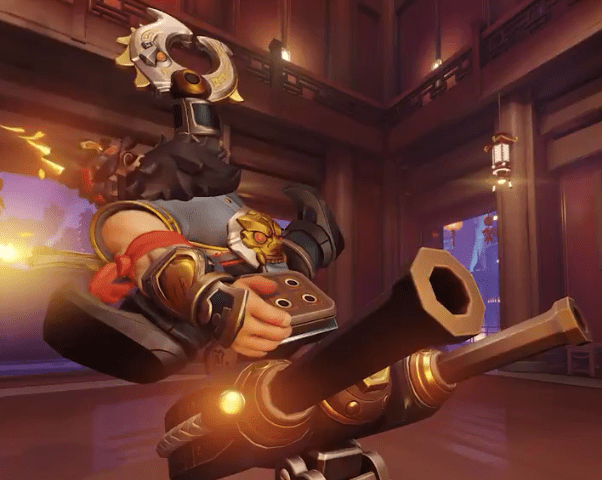 Since Overwatch’s Lunar New Year event in 2016, the Capture the Flag game mode has come hand-in-hand with the event. Players should expect a Competitive Capture the Flag mode along with the unranked version, and a new map exclusive to the CTF game mode.